We would like to present to you Yang Li’s Fall/Winter 2018 Men’s lookbook.Photos courtesy of Yang Li. We would like to present to you Cedric Jacquemyn’s Fall/Winter 2018 Men’s lookbook.Photography by Yves De Brabander. My first showroom visit was to Boris Bidjan Saberi, where I got to examine closely those tubelike garments that he put on the runway two days prior. These were padded and warm, and came with straps that could be worn over the shoulder. There were also hooded garments that sort of worked like bulletproof vests – you’d have to put them on over your had and adjust the straps on the side. Not the most practical thing, but if you are willing to make an effort, it will work. The purple dyes were rich and ranged from a deep hue on the leathers to a grayish one on tops and parkas that were more subtle and would work very well with black. There were boots with the outside zip and cut out sole in an off-white leather and variations on the Solomon sneaker, as per usual. I continue to love the light gray, bordering on oatmeal, that Saberi offers in his knits. It was a pleasure to examine Haider Ackermann’s creations up close to see how the gold-and-white vine embroidery was done. There was also embroidery that resembled cracked glass, rendering the sweatshirts and tees stylishly damaged. I also loved the olive shirt-jacket and the cropped olive jacket, and of course those long coats with removable lining. The hoodies with forgettable slogans were an afterthought, and I truly wish designers like Ackermann would not yield to temptation to produce such laziness. I don’t mind him doing sweatshirts and sweatpants when he puts his mind to it, but these seemed superfluous to an otherwise stellar array of offerings. Obviously, every store will buy them. At Ann Demeulemeester I got the same reaction I’ve been getting for the past several years. Even if I love the show there is something amiss at the showroom. I can’t quite put my hand on what it is exactly in full, but there are some elements I can point out – the lack of asymmetry, Ann’s favorite design device, and mostly oversized shapes with large padded shoulders. To put it simply, taken apart off the runway, a lot of the stuff could be worn by a banker on the weekend, and no one would be the wiser. Most of the rock’n’roll vibe comes from the styling. Even the archive pieces that have been reissued this time are the most simple ones. To be sure there is better stuff in there (I wish they’d let me in!). On the bright side, there were some beautiful wools in there, and excellent accessories, like studded wallets and such. The stand out piece for me was the shearling jacket with jagged edges that closed with strings. It was fabulous on all accounts, an update on a Demeulemeester classic. On Sunday I visited the sprawling Rick Owens showroom. The runway stuff was a mixed bag, though I particularly liked the oversized-oversized parkas in mohair and those overly long coats without collars that closed with metal snaps on the chest. The Birkenstock collaboration – no comment, but I liked the tractor sole boots, especially the all black version. They are as badass as footwear can be, and pure Rick – in your face, aggressive, and yet somehow elegant. From the precollection and DRKSHDW – the bread and butter stuff – I couldn’t say that much stood out, but a careful buyer will be able to make a good selection. I liked the shearlings in particular. Perhaps it’s insignificant, but I continue to like what Owens is doing with small accessories, especially key chains and such. 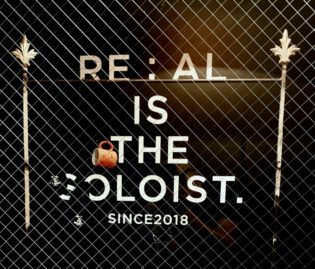 I was particularly looking forward to the Undercover and the Soloist showrooms since their phenomenal double-header at Pitti Uomo in Florence, and neither disappointed. At Undercover there was plenty for the Kubrick fan, including printed bombers, capes, and sweatshirts. There were intarsia sweaters, thought my favorite one that said “Human Error” (aren’t we all?) didn’t come in black. The piece that I liked the most was an oversized ivory colored duffle with “DISORDER” stitched out on the hood. At the Soloist, Takahira Miyashita continued his take-no-prisoners approach to both design and pricing. There were mind-blowingly constructed cashmere blazers, vests, and long coats – with multiple buckles and zippers, using a scarf as half-lining, with surgeon cuffs. 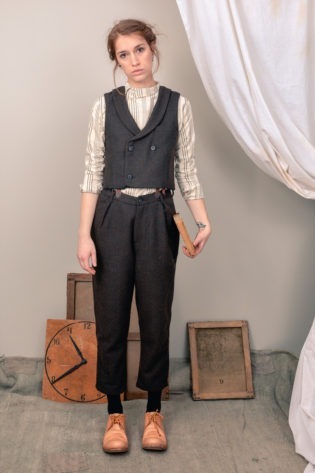 One style was a complete inversion of a tailored jacket, with all the inside pockets on the outside – (Taka once told me that his favorite part of a garment is the inside). What this will set you back at retail will make you weep, but at least you will know what you are paying for. In general The Soloist set the mood for what I saw subsequently, as smaller designers like Deepti Barth, Cedric Jacquemyn, and Misomber Nuan, also opted for complicated tailoring and premium materials at elevated price points. Their styles of tailoring are different, but the idea is similar, to make a product that is worth the premium. In the world of $1500 Vetements hoodies this is a fantastically welcome development, and I hope there is enough audience out there for these designers. One designer who has mastered this direction already is Geoffrey B. Small, and his showroom was chockfull of clothes that were impossibly lush to the touch. He continues to set the bar for quality of fabrics, from the outside to the lining. This season Small opted to put a bit more structure into his coats with hand-constructed shoulder pads, and it worked. 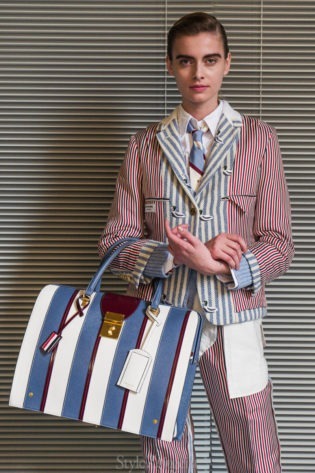 There were novel tailoring details, like a front vent on a jacket, a side vent on the pant waist, and so on. 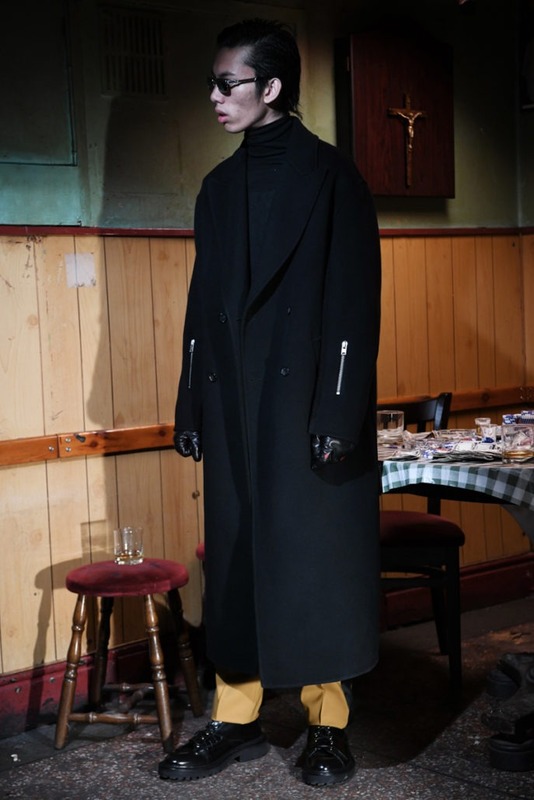 My tactile festival continued at Forme d’Expression, where Keoun Park presented an uncharacteristically dark collection of tailored coats, jackets, supplemented by brilliant knitwear. There were subtle new cuts to satisfy her fans, and I still wonder why her scarves are not in everyone’s wardrobe. Fans of m.a.+ will be glad to find out that the designer introduced a slew of new styles this season, such as a padded jacket and a zippered long coat. The latter was done in tartan that spelled “m across” in binary code. No one will know this but you – that is if your local sales person will tell you. I also liked the hoodless aviator style in light wool, which was basically a cardigan, and would layer well, and a light leather shirt. The curved zipper footwear came in a strange height that was taller than a shoe and a bit lower than a chelsea boot, but I thought it worked. At Yang Li, the designer was closing his trilogy of anti-heroes with an assured array of tailoring that hit on the fancy gambler’s attire (tuxedo pants, shirts, etc.). The pitfalls of a narrow theme is a narrow collection, but Li managed to avoid that. His SAMIZDAT line of pretend band merch took a touching tone. The designer is friends with the cult musician Genesis P. Orridge, who became too sick last year to tour. Li went ahead and produced the merchandise for the tour that never happened – complete with would be tour dates – and it felt hopeful and uplifting. I finished my exhaustive (and exhausting) showroom tour with GUIDI and Leon Emanuel Blanck. The biggest development for GUIDI was an introduction of a jewelry line made of oxidized siver, black diamonds, and of course leather. There were new styles of footwear with a heavy, chunky sole, that had a whiff of the ‘90s. There was a glorious copper color for women, a new bright red limited edition front-zip boot, as well as more small accessories such as wallets, makeup cases and so on. 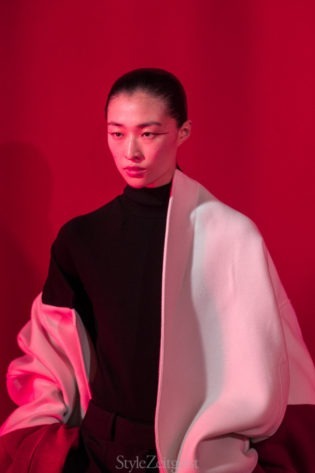 At the Blanck showroom there was a stunning off-white shearling, thick angora sweaters and coats, and a four layer padded coat that the designer almost killed himself (not literally) making. On the experimental front, Blanck made a hooded zippered coat from a fabric woven from fiberglass thread. It was probably the most fascinating thing I saw, and a nice finale to my seemingly endless showroom visits. And that’s it in a nutshell. If you want to draw some common threads, I’d say the color of the season was purple and off-white, there was more tailoring than usual, and padded jackets popped up where I least expected. Mercifully, there is still a market for men who don’t want to wear sneakers and sweatpants, and so there is a degree of optimism in an overall excellent season. Most buyers and designers are talked to sounded upbeat – unlike say two years ago – which speaks to a healthy market and a positive overall climate for mens fashion.